This type of periodic payment has come to be known as a structured settlement annuity. Such annuities are sold by insurance companies. When calculating the price it is going to charge for an annuity, the insurer determines how much it would have to invest, at current interest rates, in order to generate a stream of income at least equal to the required periodic payments. For example, if it had promised to pay $10,000 per year indefinitely , and the rate of interest that it thought it could earn was 10 percent, it would charge at least $100,000 – as $100,000, invested at 10 percent per year, would generate a stream of income of $10,000 per year. Conversely, therefore, if we observe the lump sum that an insurance company charges for an annuity that promises a specified stream of payments, we can calculate the rate of interest that the insurance company expects to obtain on the investment of that sum. For example, if it was observed that the company had charged $100,000 for a periodic payment of $10,000 per year (indefinitely)¹, we would be able to calculate that the rate of return it expected to obtain on investment of that $100,000 was at least 10 percent. We have used this principle to calculate the rate of return that insurers expect to obtain on a series of standard structured settlements. By contrasting these rates of return with the rates that Economica has been using, we can check whether Economica’s rates are consistent with those that sophisticated investors – insurance companies – expect to earn on low-risk investments. two different assumptions concerning inflation indexation: one in which the insurer increased the annual payment each year by the rate of consumer price inflation and one in which the payment was increased each year by a fixed 2 percent. The comparable figures in columns 6 and 8 of the third row of the table report the cost of an annuity that extends to the end of the plaintiff’s life, instead of to age 60 (as in the first row). The figures in the third row would be relevant if an annuity was being purchased to pay for costs of care, instead of for loss of earnings (first row). The remaining rows in the table report the costs of annuities paying $12,000 per year to a 20-year old and a 35-year old. Given the quotes reported in columns 6 and 8, we were able to calculate the real rate of interest (interest rate net of a two percent expected rate of inflation) the insurance company was expecting to receive from investment of each annuity. These rates are reported in columns 7 and 9, with the figures in column 7 referring to the quotes in column 6 and the figures in column 9 referring to the quotes in column 8. As an example, the figure of -0.95% in column 9 of the first row indicates that the insurance company anticipated that it would receive a nominal interest rate of approximately 1.05% (i.e. 1.05% nominal interest – 2.00% inflation = -0.95% real rate of interest, or discount rate). Of the twelve discount rates reported in the table, only one – the 2.10 percent rate of return in column 9 of the second row – exceeds the lowest rate used by Economica, as reported in Table 2 of the first article in this newsletter – 1.80 percent on investments of less than four years; and most of the remaining discount rates are significantly lower than the rates that we recommend. The result is that the present discounted values quoted by insurance companies for the purchase of structured settlements are considerably higher than the comparable values that would have been calculated by Economica. The latter values are reported in column 4 of the table. It is seen in column 4 of row four, for example, that whereas Economica would have calculated that a plaintiff would need $277,538 to replace $12,000 per year from age 20 to age 60; the quote we received for a structured settlement was $506,890 – 82.6 percent more. The differentials are even greater if we use the discount rate that some other expert economists have recommended – 3.50 percent. In the fourth row of column 5, for example, we report that the present value of $12,000 from age 20 to age 60 would be $252,895 if 3.50 percent is used – less than half of the $506,890 that we were quoted for a structured settlement. To conclude: in every case, the present values that we would estimate using our discount rate assumptions are considerably lower than the actual cost that a plaintiff would incur if he were to buy an annuity to fund his future losses. This is very strong evidence in support of the claims that we have made over the last several years that our discount rate approach is a conservative one. 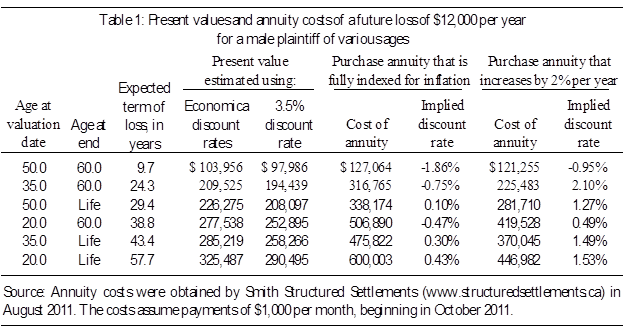 Based on the costs to purchase structured settlement annuities, and the plaintiff’s ability to demand that his/her loss be funded using this “periodic payment” approach (given Section 19.1 of the Judicature Act), it follows that any reasonable change to our discount rate approach would be to use lower rates, not higher (as some other experts have argued). As noted above, Heber Smith, of Smith Structured Settlements generously provided us with quotes on various annuities which we used in the creation of this article. On previous cases, we have worked together with Mr. Smith when the plaintiff’s lawyer chose to argue that damages should be satisfied by periodic payments (in accordance with Section 19.1 of the Judicature Amendments Act), rather than a conventional present value. An advantage of having future losses assessed in this manner is that it removes the subjective nature of opinions concerning the discount rate. Instead of relying on opinion concerning the rate of return that a plaintiff will earn on his or her investments, we can determine precisely how much it will cost the plaintiff to purchase annuities to fund the future losses. Smith Structured Settlements serves the personal injury community as an annuity brokerage specializing in the preparation of fee-based Section 19.1 damages reports. Should you wish to investigate such an option they may be reached at www.structuredsettlements.ca.